There are three main electric bike parts which separate an electric bicycle from a traditional bike; the battery, the motor/hub and the controller which acts as the brain for all the electrics. Excellent for the commuter who needs to pack a bike away into a rucksack, on a train or into the corner of an office, and still travel home for pennies. Built for speed and comfort, electric road bikes are perfect for getting across town quickly. A long distance commute becomes very easy on a decent road bike. Your mountain excursions and leisure rides will be even more fun with that extra bit of “oomph”. And you’ll still have enough energy to make the trip home. Electric Hybrid Bike Not to be confused with a petrol/electric ‘hybrid car’ A mix of a road bike with a bit of mountain bike pedigree, hybrid bikes are becoming more and more popular with commuters who enjoy leisure rides at the weekends. Although they’re rare, you can also get tandem electric bikes for two riders. From these types of bicycles, you get two types of electric bikes. You can also convert your existing bicycle to an electric bike with the help of a conversion kit. Perfect for DIYers, cyclists who already have their perfect bike, and it can save you money. The first type, is the pedal-assist electric bike. You ride it just like you would a normal bicycle, but it uses a torque sensor to add power according to how hard you pedal. Excellent for climbing up hills, sweat-free commuting and very useful if you want to improve your fitness by putting in more effort. 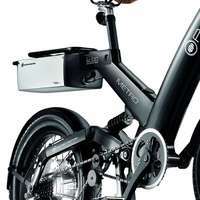 The alternative is the throttle-assist electric bike which is more like a moped. You have a throttle on the handlebars or a button which connects to your motor, and you add power as well as cycling. This works really well if you’re not so agile and don’t always want to be pedaling. Most bikes will use ‘v-brakes’. These work by using rubber and clamping the metal wheel. However, with an electric bike that is usually travelling at higher speeds, its better to use disc brakes for the faster stopping time, like you have on a car. Many electric bikes have disc brakes, but the difference really is personal. Try electric bikes with and without the disc brakes and see if you notice the difference. Bikes come with different frame sizes. Your perfect bike depends on your height and length of your legs. Taller people with longer legs will need larger frame sizes. Take a look at the frame size calculators here. Remember, the battery is a critical component of any electric bike. Make sure you buy a branded battery where possible, with at least a two year guarentee. Generally, lithium-based batteries offer the best mix of performance, size and weight. You’ll find them standard on most reputable electric bikes. Lithium-based batteries are really future-proofing your investment since they don’t require nearly as much maintenence or looking after compared with othe batteries. Lithium-ion, lithium-polymer and soon lithium-sulphur batteries are all popular amongst good electric bike manufacturers. If you want to read more about the science of batteries, read Battery University. Batteries don’t normally work as well with fast charging. For everyday commuters, an overnight charger is perfect but for those pushing the mileage like couriers, leisure riders, police officers a second battery might be a worthwhile investment. Also consider getting a pedal-assist electric bike for the extra range, since it encourages you to work as hard as the motor. Look out for the battery replacement costs, which can surprise you. You’ll maybe need to replace your battery every three years depending on usage and quality, but despite the high initial costs, it’s much cheaper than petrol! Typically, you have a motor attached directly to the centre of the wheel - either a front hub motor or a rear hub motor. Hub motors are usually less-effective on hills compared to crank-drive motors, and often come with more limited gears. A rear hub motor is great for general use, although if you’re going offroad, a front wheel hub motor has the advantage of givng you ‘all-wheel-drive’ which really helps with traction; a big plus for electric mountain bikes. There is a third way. The Panasonic drive system is designed to be low and in the middle of the bike which lowers the centre of gravity helping with stability. Since it works with the bike chain, you can have a full range of gears which helps when you’re going up hills. The Panasonic drive system uses an electric torque sensor which measures how hard you’re pedalling and gives you a boost to match the level of effort you’re putting in without interferring with the chain and causing any kind of drag. A huge river could be going over a waterfall really slowly, and still have the same amount of water as a smaller river moving faster. The same works with volts, amps and watts; a huge current (amps) could be flowing very slowly, and still have the same amount of energy as a smaller current moving very quickly. The voltage of an electric bike will typically be between 12 and 36 volts, which isn’t high enough to give you an electric shock (230 volt mains electricity can kill you on the other hand!). Higher voltages are better because electricity passes far more efficiently than at lower voltages. Amps (or amperes) are a measure of current. Think of the volume of water moving. You can expect an electric bike motor to work between 10 and 60 amps depending on the model. Watts are a measure of total power. A small, fast river can have the same “power” as a larger, slow one. Currently, electric bikes are legally limited to 250 watts in the UK, or you’ll need to get a moped licence. The next chapter will help you decide what kind of electric bike is best for you.